The last three weeks I have been taking golf lessons through our Professional Golf Management program. Now I can actually hit the ball and when I swing, and it goes almost straight. I know, I know, I said I would never take up golf, that is was a boring sport, but then I thought there could be worse things in the world then spending a few hours with my husband outside in the sun. 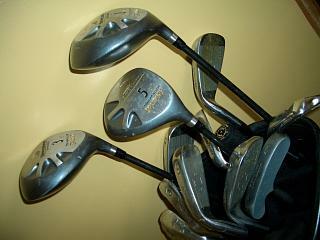 So Mark bought me a starter set of clubs last year at an UNNAMED golf franchise store. The smallest set they had (I am only 5'2) seemed long. The 14 year old sales boy assured me they were fine. So I went for my lessons. The instructor took one look at them and told me they were almost surely too long, but that I should talk with Al. Al is the course 'club whisper', actually he is a custom club craftsman, but I like the term club whisper better. Any who, he has me do a couple of practice swings, talks in a low voice to the club and sure enough he say they are WAY to long and need to be cut down by a whole inch! Vindicated never tasted so good! Take that 14 year old sales boy!